Eco-Sys Action was again this year an active partner of Monacology, which set up its eco-village along Monte Carlo harbour. It donated a giant tiger for auction and run an Eco-6 shop with some proceeds going back to Act for Nature, the organizers. 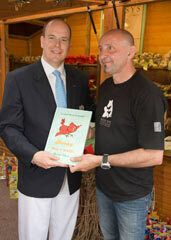 Prince Albert II was kind enough to pay a visit to Eco-Sys Action and was given a Boopy book by our director, Philippe Gavotto. Eco-Sys Action animal costumes were also in action around the village and created a fun atmosphere among the visitors. Act for Nature and the Stars N Bars worked very hard on this second edition of Monacology and we are looking forward to next year with the village getting bigger and bigger and attracting every year more schools to visit. Kids are taught about their environment like the Mediterranean Sea, Madagascar ecosystem, etc. 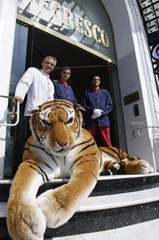 Our giant tiger plush was a star at the world-famous Negresco Hotel in Nice, France. 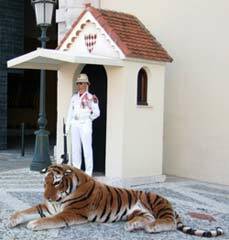 We were welcomed by the Negresco's staff, and even their cat mascot said hello! Overall, it was a comfortable and enjoyable stay. Official authorization was also given by Monaco Palace for a photo shoot there. The late afternoon was spent on a beautiful American sailing boat anchored in Monte Carlo harbour on her way around the world. We'd like to thank Nicolas Cegalerba for his great shots. After his expedition in Guyana and Madagascar, it was a refreshing change for him to take care of our giant plush tiger! Enjoy his art at ncegalerba.com and don't forget to look at our photos on his website. 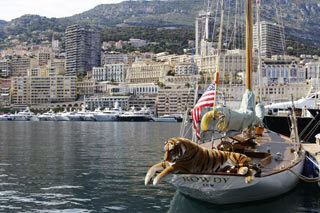 Monaco - Eco-Sys Action & Eco-Fun were the official partners of the 2nd Monacology Exhibition in Monaco. Organised by Act for Nature, the event was a great success. Hundreds of school kids were taught about the environment, learning about Madagascar's ecosystems, the survival of the Perrier's Sifaka lemur, turtles' fight for life in Senegal, and the Mediterranean Sea's ecosystem. The famous green Monacology silicone bracelet was distributed to every kid and again, the star of the week was our giant tiger plush (2 m 40 /7 feet +) which amazed everybody, including Formula One great Harald Franzen and his children. Eco-Sys Action & Eco-Fun had a booth and our eco-plush toys, recycled bags, and T-shirts sold like hot cakes!